It happened, like most things since 2005 tend to do, because of a Facebook post. 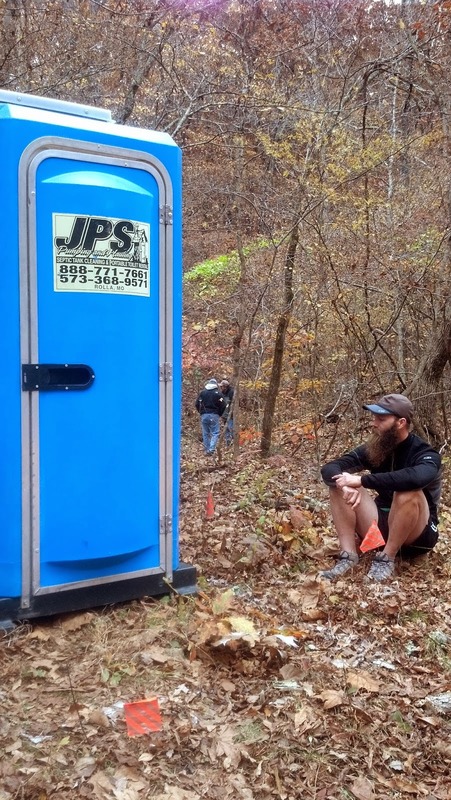 My friend Jim advertised his recent registration for the Ozark Trail 100, a one hundred mile, point-to-point, run on you guessed it, the Ozark Trail. Ever since I got into endurance events a few years ago, I have secretly dreamed about being an ultramarathon pacer. I don't know why, but I think it's related to why I dislike climbing but love belaying. I've always been more attracted to playing the supporting instead of starring role, and getting the chance to support someone's 100-mile dream was extremely appealing. But just like I'm choosy about my AR teammates, I wanted to be choosy about anyone I paced. And despite not really ever training together, I knew Jim would be a great person to pace for - fit, level-headed, and most importantly, DETERMINED. I can't stress that last word enough. I know very little about the mystical world of ultrarunning, but I do know that the biggest trick to any endurance event is getting your mind right. And I could sense through the magical power of the interwebz that Jim's mind was right. Let's do this! Now, before I get too far into this post, I want to acknowledge that this isn't exactly my story to tell. First and foremost this is Jim's story, and I was only a character for the 29-odd miles I paced him. I do want to share my observations on the weekend because I learned SO MUCH, but I also want to preface that with the understanding that Jim went through 10 times more pain and suffering than I did. So before you read any further, go read his exceptionally well-written race report! I have really only hung out with Jim a few times, mostly at bike races, so I felt it was important for me to check in with him at the pre-race meeting on Friday night. There was nothing tangible that he needed help with, I just didn't want the first time we met up to be 68.4 miles into his race. So I drove down to Bass after work, caught the last part of the pre-race meeting, and then found Jim with his wife Sara and son Jake. The four of us chatted a little bit, mostly figuring out some vehicle logistics, and Jim was super laid-back and calm. I think he and I are similar in that we put a lot of effort into race research and preparation so when the time comes to actually race, there is no reason to be frantic or nervous. Just wake up and press play. Jim and his family would be staying in a hotel closer to the start line so I said good night to them and then drove over to Berryman Campground for some free camping. The night was beautiful and I slept really well - almost 12 hours! Sammy you're ruining my selfie!! The following morning was also wonderful. I didn't have to be anywhere until 12noon so I made breakfast and drank my coffee while pouring over the race logistics. I made myself a little cheat sheet of course details. I've never paced anyone before, but I just thought about what information I would like to know if I was on the point of exhaustion, and then wrote that stuff down. Then I looked at the race maps to make sure I knew where the course went - I've trained and raced a lot in this area but didn't want to confuse this course with any past memories. Then I was visited by the resident canine of Berryman Campground...Sammy. She's a gorgeous bloodhound that lives right down the road and I thought I had heard her snuffling around during the night. She is such a sweet dog and it was awesome to hang out with her for a little bit before her owners drove through and picked her up to go hunting. There were some other people in the campground, and they turned out to be volunteers setting up the aid station (mile 81.3). So I chatted with them and got updates on the race from the HAM radio guy Steve. There were also some mountain bikers cruising through that I knew so it was like social hour! After a while I looked at my watch and realized I had to leave RIGHT NOW to make it back to Bass on time. Bye everyone! Jamie and the portapotty. We sat here for a while. It did not smell. At Bass I met up with Jamie, who was Jim's other pacer. We drove down to the Brooks Creek aid station (mile 43.5) where Jamie would start running with Jim. It was a really fun drive because I'd not really met Jamie before either, just raced against him on bikes and in AR, so it was good to meet the man behind the beard. Before the weekend, I was pretty sure Jamie was awesome, but now I am entirely convinced! Once at Brooks Creek, we found Sara and Jake and just hung out for a few hours waiting for Jim to come through. It was so cool to see the lead runners. This was another reason I really wanted to pace at an ultra - I just wanted to stare at observe the runners. What shoes were they wearing? Packs? Hydration strategies? Clothes? Calories? All of these things are important to me in adventure racing and anytime I can view them from another perspective I love it. Then Jim came in and we got him through the aid station really quickly - sock change, new bottles, up and out! 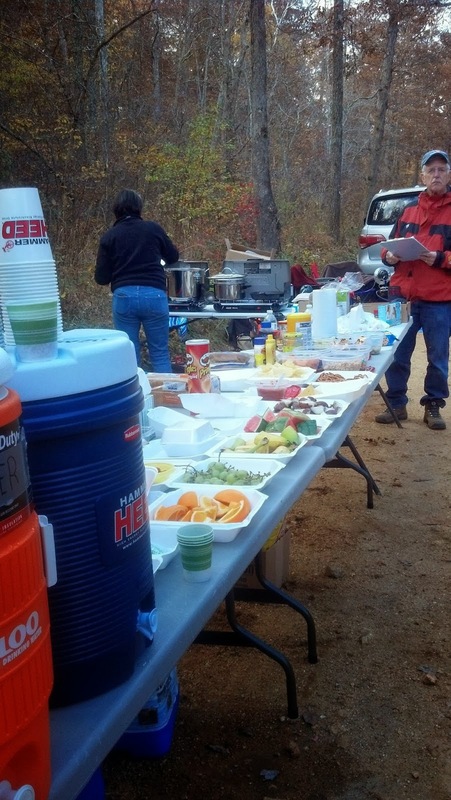 Another thing that's awesome about ultras are the aid stations. 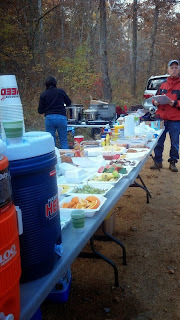 We don't get aid stations in adventure racing, and my world was ROCKED when I saw the spread at the OT100. I'm sure this is standard fare for ultras but still, amazing. Fruit, chips, cookies, candy, several different kinds of each. And hot soup, coffee, hot chocolate! And, at Brooks Creek they were making grilled cheese sandwiches. These took a little longer to prepare so Jim ordered one and then started hiking up the trail. Jamie waited for it to be finished and then took off to start their next 25-mile leg. There were a few more aid stations in there but they didn't have crew access so Sara, Jake and I drove to Hazel Creek at mile 68.4. Once we got to Hazel Creek, we had several hours to kill. I napped a little, hung out at the fire, chatted with the HAM guys, tried to eat food but not too much. What do you eat when you're getting to do a marathon at an unknown starting time at an unknown pace? I snacked on some bread, some jerky, and an apple. Once runners started coming through it was dark, and I hovered around the gear bags, watching everyone. I had my CAMP 10L vest already packed and wow, compared to everyone else's stuff, it was super heavy. I had a lot of unknowns when it came to time in between aid stations so I played it conservative with a lot of water. And I didn't know if pacers were allowed to eat from the aid stations so I brought all of my own calories. In hindsight, I could have gone with about 0.5L water and 500 calories. But once the pack was on my back it was super light anyway. And then, after lots of waiting, Jamie and Jim came storming in! Honestly, I freaked out a little bit. We had been chill for so many hours and then all of a sudden it was TIME TO START THIS PACING THING THAT I HAVE NEVER DONE BEFORE! Ah! But Jim had a few things to accomplish at the aid station so I hurriedly put myself together and then...we were off! We started jogging out of Hazel Creek with me in front. Jim used the first couple miles to update me on his condition, his pace, what reminders he wanted, etc. He said that the last 25 miles with Jamie had been really strong and he was feeling good. So I focused on setting a pace on the stronger side of "all-day" which means fast-hiking the uphills and shuffling everything else. I had a Stella 300 on my head so I was able to really light up the singletrack. The first section had a lot of gravel road crossings which I thought would be useful landmarks but they all sort of ran together and we didn't need them for motivation anyway. The great thing about pacing someone you don't know all that well is there are lots of things to talk about. And I think Jim and I covered them all - we talked a lot. I did tell him at the beginning to just shut me up if I got obnoxiously cheerful (I tend to do that, and given the mileage imbalance between us, I didn't want to be annoying). I thought Jim was moving pretty well and in no time we were at my first aid station - Pigeon Roost at mile 75.9 (the one with the snowman). I had figured out by then that I was allowed to eat aid station food so once I got Jim's bottles sorted and calories met (soup and coffee), I got myself some potato soup and hot chocolate. It was awesome! Jim sat down and I wasn't quite sure if I should hustle him through or let him relax. I shouldn't have worried because after a few minutes he stood up and marched out of the aid station. I hurried after him, trying to slurp down my hot chocolate before we passed the last garbage bag. 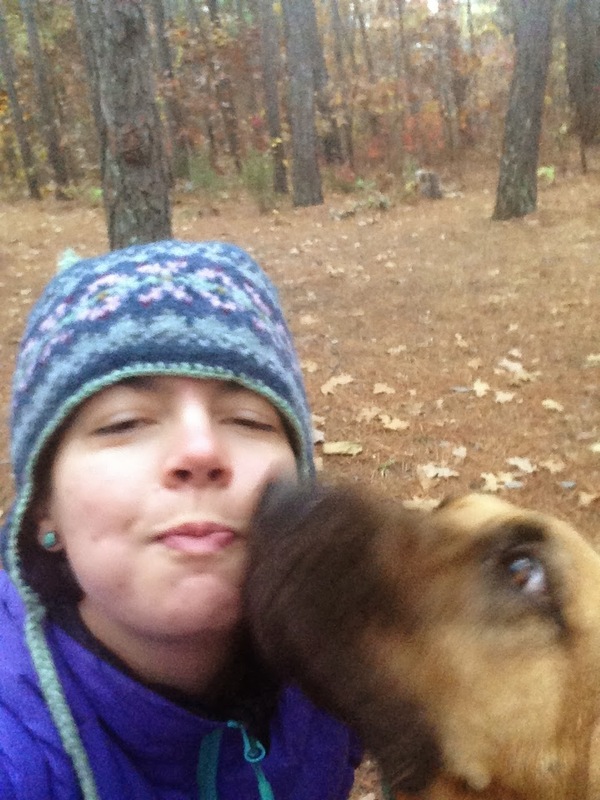 We deposited our trash and then got set for a short (5.5mi) leg into Berryman Campground. In my mind, this is where Jim started to struggle (he said he was hurting before Pigeon Roost but I couldn't tell). There were two other runners, one of whom had a pacer, that left the aid station near us and we got caught up with trying to get ahead of them. I was happy to push the pace and show everyone how strong Jim was. We had only been running together for a few hours but I knew he was going to do really well. We got ahead of the crowd (yes, in ultrarunning, 3 other people is a crowd) and then Jim's stomach revolted. He felt sick and couldn't jog anymore. We let the other runners by and after a little bit, Jim felt like puking. I've had adventure race teammates throw up before and it's usually a good thing so I encouraged him to go for it. And he did! Loudly! It reminded me of those yelling goats and I had to smile. I knew he was feeling horrible but I tried to explain that puking is no big deal and it's kind of awesome to have a scream-puking style like his. So after a few minutes we were able to continue on down the trail and he was feeling a tiny bit better. Despite the extreme pain I knew he was feeling, I wanted to help make sure his experience was enjoyable so we spent some time looking at the stars, and at a small (screech?) owl who landed near the trail. Eventually we came to a section of the OT that I had raced (albeit, in the opposite direction) on my mountain bike just the weekend before so I was able to give Jim some landmarks until the next aid station. We had a big downhill, then some flats, then a sand pit, then a creek crossing, then a highway crossing, then a long climb up into Berryman Campground. I was starting to get really worried about Jim's lack of calorie consumption and I suggested that he take as much time as he needed at the aid station to be able to eat again. 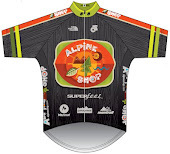 My Alpine Shop teammate Jeff ran this race a few years ago and had to spend 40 minutes at an aid station doing the exact same thing. I knew Jim didn't like stopping at aid stations, but he didn't really have any fuel in him at that point so it was absolutely necessary to take care of that before continuing the race. Luckily, Jim agreed with me so once we saw the lights of the campground, we enacted our plan. Crews were allowed at Berryman Campground (mile 81.3) so only a few minutes after arriving, we were swarmed by Sara, Jake, and Jamie. They helped Jim get into warmer clothes while I started calling out aid station foods, hoping that something would sound good to Jim. He decided to try some hot chocolate and noodles which actually stayed down. I was encouraged. Once he was eating, I snacked, changed my headlamp battery, put handwarmers in my gloves, and put on another long sleeve shirt. The aid station volunteers had pierogis which were really delicious. It didn't seem like very long before Jim was feeling strong again, so we got ready to leave (looking at the garmin file, we spent 30 minutes there, but honestly it didn't feel like that long). Walking out of Berryman Campground was heartbreaking for me - Jim did not look good. I can't really explain it, but it just pained me to see a really strong athlete hurting so much. In the half-marathon or so between Hazel Creek and Berryman Campground, I felt we'd gone from "Facebook friends" to genuine friends and it's always hard to watch my friends struggle. I knew this next section would be difficult so I put all of my focus into getting Jim through it. The next section was 8.8 miles of singletrack where the Ozark Trail and Berryman Trail run together. I have ridden this trail several times, so I knew we were in for a long, tough, dark, cold section. We were hiking most of this and I was really glad that I was there for Jim - he was stumbling more than usual and had trouble following the trail in a few spots. It would have been easy for him to hike right off the trail and not even realize it! I knew this was just fatigue, and probably normal for someone who has covered 80+ miles on foot, so I just tried to be as encouraging as possible. I fought the sleep monsters a little bit too but the chilly temps and my supply of BuzzBites kept me alive, awake, alert, and enthusiastic. I kept reminding Jim that we were in the "crux pitch" of the entire race right at that moment - one of the longest segments, in the darkest part of the night, in the coldest temperatures, with the most fatigue and soreness - and it was normal to feel horrible. In his race report, Jim says that I saw him at his worst, which is true, and it hurt me to see my new friend suffering so much. But I also saw him at his best - fiercely refusing to give up. He even cracked a joke that he was going to quit at the next aid station. I kind of flipped out on him, maybe even yelling a little that quitting is not an option, but he laughed and then I realized he was kidding. Then I knew he was going to make it. We kept on putting one foot in front of the other and I got a first-row seat on what it means to be tough. Finally, finally, we started to see lights on the next ridge ahead of us, and they turned out to be the Billy's Branch aid station at mile 90.1! Jim and I decided to repeat the sit-blankets-eat routine that had helped so much at Berryman Campground. I got him set up with hot chocolate, noodles, pretzels, and saltines, and then inhaled a bunch of homemade chocolate chip cookies. YUM. While we were nestled in the warmth of the aid station, 2 other runners came into the tent and Jim started to get agitated. As awful as he felt, this was still a race and he was still competing. Time to go! We marched out of Billy's Branch with authority. One more segment to go and then we would trade off pacers for the homestretch. I knew the sun would be rising soon, and how powerful that can be for my motivation. So the second I saw a lightening eastern sky, I pointed it out to Jim. It was like adding gasoline to coals of a fire! All of a sudden Jim was throwing down some fast power hiking and even RUNNING. I had no idea where his strength came from but was delighted to jog with him. On some of the more open reentrants we spotted a runner (Tony) behind us, and Jim was determined to stay ahead of him. We kept the pressure on, all the way into the last aid station - Henpeck Hollow! On the last climb into the aid station, we started talking strategy. Jim didn't want to stop - he wanted to ride the wave of continuous forward momentum all the way to Bass. So I took his vest and bottles with instructions for Jamie. We hiked into the aid station and Jim kept marching as I transferred everything to Jamie. And just like that, the two guys were gone and my pacing duties were over! Sara and Jake were at the aid station, along with the volunteers and a really nice campfire, so I unwound from my overnight pacing marathon by sharing stories and even getting a cup of soup from the buffet. A few other runners came in, including Tony, but after a bit it was clear there was a gap in the field. So we drove back to Bass to catch Jim's finish. It was a wonderfully sunny morning and so nice to be outside. We watched a few runners come in, and I had a chance to catch up with Jake from the BT Epic who was scouting a new, totally rad course for 2014! 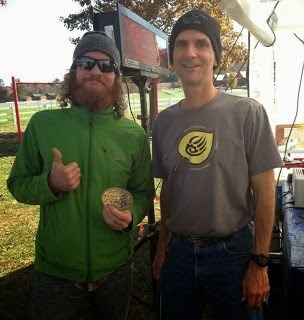 And then, we saw the two bearded wonders pop out of the woods and jog into the finish line! It was so cool to see Jim finish what he started out to do. Even though the day didn't go quite as planned, he stuck with it and never gave up. I felt really grateful to be a part of his experience, and to get a peek inside the fascinating world of ultrarunning. After the finish, the five of us sat around the finish tent, eating chili and swapping stories with each other and other runners. The vibe inside the tent was amazing - everyone was exhausted but really satisfied with the monumental achievement of either running 100+ miles themselves, or helping someone else accomplish their dream. I felt extremely lucky to be part of Jim's team. Jamie had already finished the OT100 a few years ago, so of course the boys asked me when my first attempt at the distance would be. And honestly, after seeing what Jim went through, I replied that it will be a long time before I ever take a crack at a 100-mile ultramarathon. Jamie chimed in that pacing for a hundo is sort of like watching a child have a temper tantrum meltdown - it makes you think twice about having kids. Pacing Jim was definitely ultramarathon birth control for me - I don't want to try it anytime soon! I sure do love my long adventure races, but at least that running is broken up by biking and paddling! That is a sweet buckle! Jim with Race Director Paul! I can't say enough about how much fun I had pacing Jim at the OT100. The whole weekend gave me a great perspective at the closely related worlds of ultrarunning and adventure racing. I felt like I learned a lot watching the top runners, and was able to give a lot helping Jim through his darkest hours. I went into the weekend not really knowing all of the team members, and came out with 4 new, awesome, amazing friends. Very cool to read the race from your perspective, too. very cool to be out there! you should try pacing sometime! so fun! I have read it a couple times now, it brings back so much. I feel really lucky to have met such cool people in life. I couldn't have asked for a more experienced and attentive pacer to spend such a crazy night with. That goat video cracks me up! oh good, i am glad you like the goat vid!! don't be embarrassed about scream-puking. it's awesome, and effective. Both years I've done this, those miles from 80-97 can get really dark so I'm glad Jim had someone there. That's for sharing your story! Emily awesome job. Great that you just decided to pace and went for it. I read your blog just before I signed up just to be absolutely sure which I am. I was a vaolunteer this year to get the feel and give something before I tried it. Steve S.
Bannerizer makes it easy for you to promote ClickBank products using banners, simply go to Bannerizer, and grab the banner codes for your selected ClickBank products or use the Universal ClickBank Banner Rotator to promote all of the ClickBank products.